please excuse the not-so-bright colors here...it was dark out and I didn't have much to work with!! It was very pretty in person, trust me. Serves two – I got my mom to share it with me! 1. Preheat oven to 375 degrees Fahrenheit. Cut parsnip and potatoes into similar sizes that your halved/quartered potatoes are. You want all of the veggies to be about the same size so they cook at about the same time. 2. Throw all veggies except scallions in a bowl and coat with olive oil, add salt, and mix. Transfer to roasting pan or baking sheet. Push scallions around in bowl to coat with the oil and salt that will be left, and add to pan. 3. Place oven and set timer for 40 minutes. The scallions should be nice and crispy after 20 minutes, so keep an eye on those – they will have to come out first, along with any smaller pieces of veggies that might brown quicker. 4. In the meantime, cook your wild rice (or brown rice, or whatever kind you like!). When done, fluff with a splash of olive oil. Try to coordinate the completion of your rice with the completion of your veggies – but if you don’t, that’s what microwaves are for (shh!). 5. Occasionally flip your veggies with a spatula while cooking. 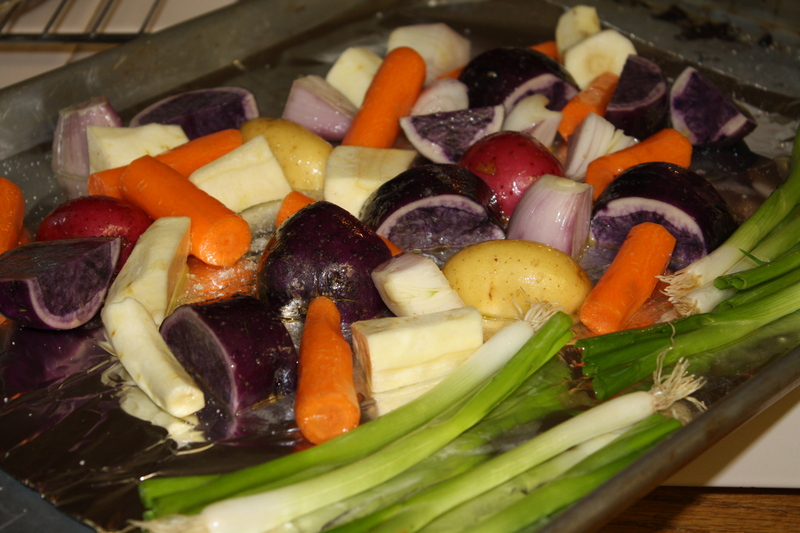 They will take from 40-60 minutes to roast; they’re done when they are tender and nicely golden brown. Your house will start to smell delicious after about ten minutes, to patience is tough here. 6. Put rice on big plate, place veggies on top, grab two forks and share! (That’s what Mom and I did, at least 🙂 ). This was super yummy and did keep me full until my post-surgery Jamba Juice smoothie, which I had to eat with a spoon because you’re not allowed to drink with a straw when you got your wisdom teeth (tooth) out. Bummer. 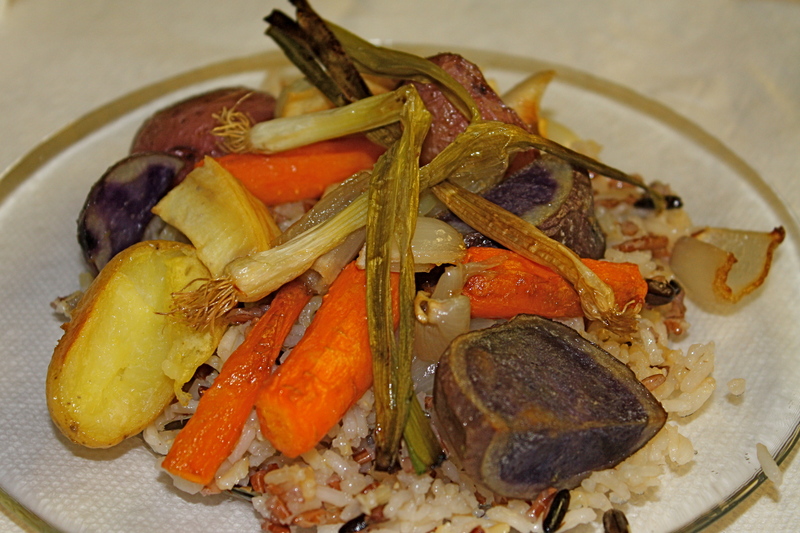 This entry was posted in main course, salad, vegetables, vegetarian and tagged carrot, parsnip, potato, roast, roasted, salad, shallot, wild rice, winter by Laura Zolnoski. Bookmark the permalink.